The Fiscal Year 2012 appropriation provides NIH with $30.86 billion and NIGMS with $2.43 billion. 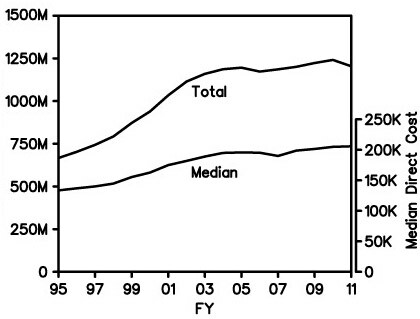 The NIGMS figure represents an increase of 19% over Fiscal Year 2011 due to an increase in funds for programs transferred to NIGMS from the former National Center for Research Resources. Noncompeting research project grants (RPGs), both modular and nonmodular, will be issued with no inflationary increases for Fiscal Year 2012 and all future years, except for special needs such as equipment and added personnel. Fiscal Year 2012 competing awards will be held at an average cost comparable to Fiscal Year 2011 competing awards. Fiscal Year 2012 awards that have already been issued will be revised to adjust the award level in accordance with the above policies. For Ruth L. Kirschstein National Research Service Awards (NRSA), all stipend levels will increase by 2%. The President’s Fiscal Year 2013 budget request , which was released on February 13, maintains the current NIH budget of $30.86 billion, similar to the Fiscal Year 2011 and Fiscal Year 2012 appropriations. The President’s Fiscal Year 2013 request for NIGMS provides a budget of $2.38 billion, a slight decrease from Fiscal Year 2012 but comparable to the Fiscal Year 2011 level of support. The Fiscal Year 2013 request includes a decrease for the IDeA program, which received a 1-year increase in Fiscal Year 2012. Details of the budget request for NIH are posted on the NIH Office of Budget Web site. The NIGMS request is detailed in our Fiscal Year 2013 budget justification, which includes a budget mechanism table, budget graphs, a Director’s overview and a justification narrative. Purpose: Request supplemental funds to existing research grants to meet increased costs that are within the scope of the approved award, but that were unforeseen when the new or renewal application or grant progress report for noncompeting continuation support was submitted. At NIGMS, funds for administrative supplements have always been and will continue to be limited. If you are thinking about submitting an application for an administrative supplement, contact your program director to discuss whether the application is likely to be competitive for funding. Fiscal Year 2011 ended on September 30, 2011. As in previous years, we have analyzed the funding results (including percentiles and success rates) for R01 grants, shown in Figures 1-5. Thanks to Jim Deatherage for preparing these data. Figure 1. Competing R01 applications reviewed (open rectangles) and funded (solid bars) in Fiscal Year 2011. Figure 2. 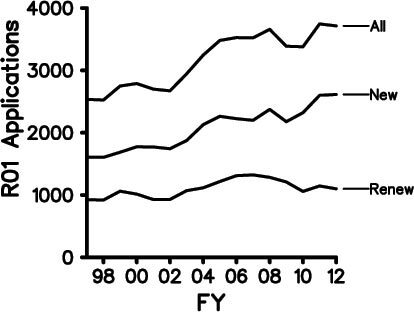 NIGMS competing R01 funding curves for Fiscal Years 2007-2011. 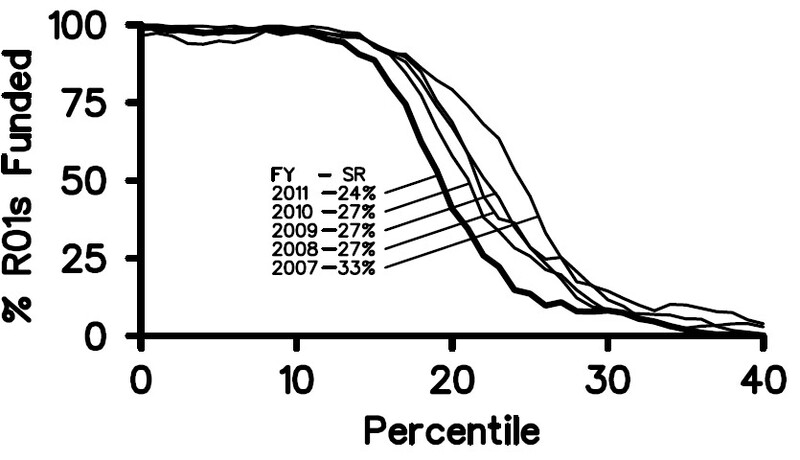 For Fiscal Year 2011, the success rate for R01 applications was 24%, and the midpoint of the funding curve was at approximately the 19th percentile. 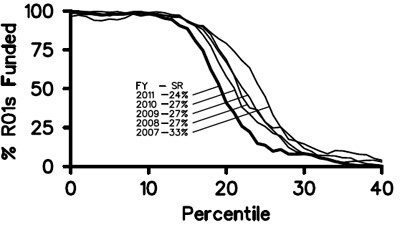 Although the number of competing R01 awards funded by NIGMS in Fiscal Year 2011 was nearly identical to those in the previous 2 years (Figure 3), the success rate declined in 2011. Factors in this decline were a sharp increase in the number of competing applications that we received in 2011 (Figure 4) along with a decrease in total funding for R01s due to an NIH-wide budget reduction. For more discussion, read posts from Sally Rockey of the NIH Office of Extramural Research on NIH-wide success rates and factors influencing them. Figure 3. 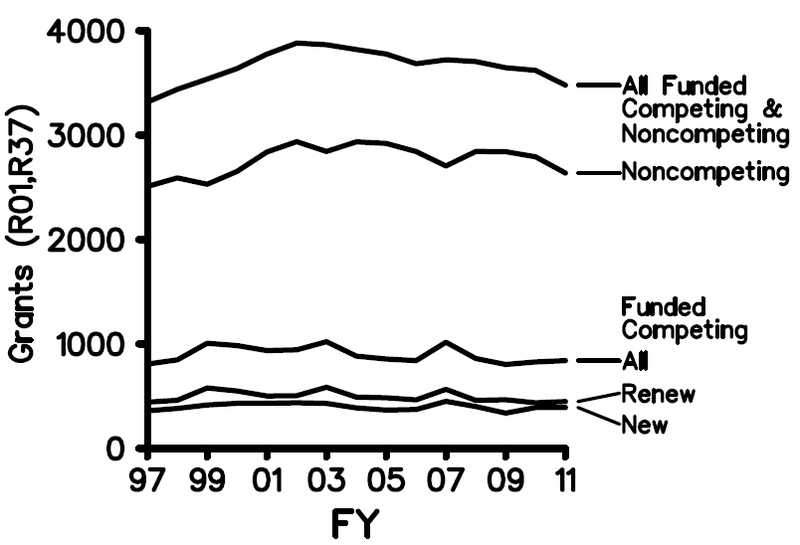 Number of R01 and R37 grants (competing and noncompeting) funded in Fiscal Years 1997-2011. Figure 4. 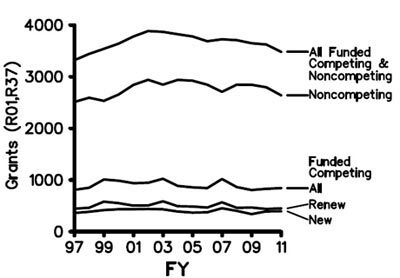 Number of competing R01 applications (including revisions) received during Fiscal Years 1998-2012. Below are the total NIGMS expenditures (including both direct and indirect costs) for R01 and R37 grants for Fiscal Year 1995 through Fiscal Year 2011. Figure 5. The upper curve shows the overall NIGMS expenditures on R01 and R37 grants (competing and noncompeting, including supplements) in Fiscal Years 1995-2011. The lower curve (right vertical axis) shows the median direct costs of NIGMS R01 grants. Results are in actual dollars with no correction for inflation. In Fiscal Year 2012, we have received about 3,700 competing R01 grant applications (including revisions) and anticipate funding about 850 of these with the Fiscal Year 2012 appropriation. We expect the R01 success rate to be between 24% and 25%. Because the competing application numbers and the total R01 budgets for Fiscal Years 2011 and 2012 are similar, the funding trends will likely be comparable. 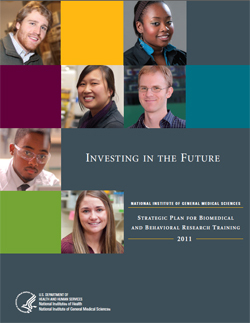 It’s been nearly a year since we posted our Strategic Plan for Biomedical and Behavioral Research Training. In August, I announced that we were on course to implement most of the plan in early 2012. I’m very pleased to tell you that our Blueprint for Implementation is now available. As you’ll see, it’s truly a blueprint, and in the months ahead we’ll be posting more details and guidance about each of the action items. One of the most important messages in the blueprint is that research training is a partnership between NIH and the academic community. We recognize that addressing many of the action items depends on those of you in the front line of training. We also know that many of you already do an excellent job of training and mentoring students and postdocs. Nevertheless, training outcomes can always be improved, and our blueprint aims to provide our view of what excellent training is, along with encouragement and resources to adopt and improve certain practices to achieve the goals of the action items. These ideas are based on the broad input we received over the course of our strategic planning and implementation process. I encourage you to read the blueprint and the other documents that we post on our new training partnership Web page and send us your comments, questions, suggestions and examples. As the director of NIGMS from 1974 to 1993, Ruth L. Kirschstein molded the Institute’s agenda for basic science, research training and promoting diversity. She also set a tone for the Institute that remains to this day. After leaving NIGMS, Ruth went on to serve as the deputy director of NIH, and, for two periods, she was NIH’s acting director. From the time she recruited me to NIGMS in 1981 until her death in 2009, Ruth was also my mentor and friend, as she was to many others who worked for or interacted with her. I highly recommend this book to anyone interested in reading about an extraordinary woman and her dedication and many contributions to NIH and beyond. The book is available for free in several digital formats. 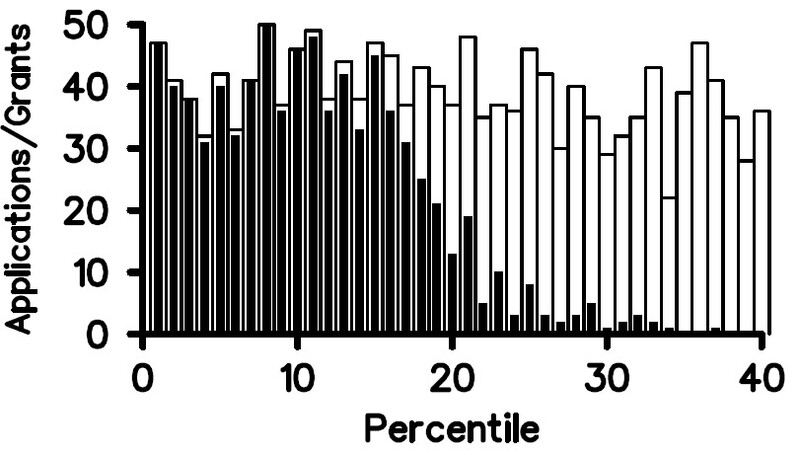 One of the most common questions that applicants ask after a review is why the overall impact score is not the average of the individual review criterion scores. I’ll try to explain the reasons in this post. What is the purpose of criterion scores? Criterion scores assess the relative strengths and weaknesses of an application in each of five core areas. For most applications, the core areas are significance, investigator(s), innovation, approach and environment. The purpose of the scores is to give useful feedback to PIs, especially those whose applications were not discussed by the review group. Because only the assigned reviewers give criterion scores, they cannot be used to calculate a priority score, which requires the vote of all eligible reviewers on the committee. How do the assigned reviewers determine their overall scores? field(s) involved.” In determining their preliminary impact scores, assigned reviewers are expected to consider the relative importance of each scored review criterion, along with any additional review criteria (e.g., progress for a renewal), to the likely impact of the proposed research. The reviewers are specifically instructed not to use the average of the criterion scores as the overall impact score because individual criterion scores may not be of equal importance to the overall impact of the research. For example, an application having more than one strong criterion score but a weak score for a criterion critical to the success of the research may be judged unlikely to have a major scientific impact. Conversely, an application with more than one weak criterion score but an exceptionally strong critical criterion score might be judged to have a significant scientific impact. Moreover, additional review criteria, although not individually scored, may have a substantial effect as they are factored into the overall impact score. How is the final overall score calculated? 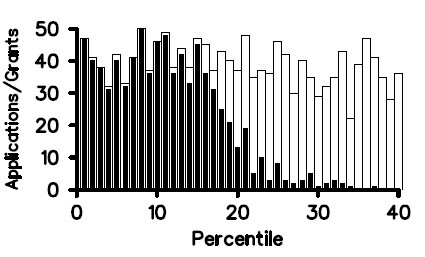 The final impact score is the average of the impact scores from all eligible reviewers multiplied by 10 and then rounded to the nearest whole number. Reviewers base their impact scores on the presentations of the assigned reviewers and the discussion involving all reviewers. The basis for the final score should be apparent from the resume and summary of discussion, which is prepared by the scientific review officer following the review. Why might an impact score be inconsistent with the critiques? Sometimes, issues brought up during the discussion will result in a reviewer giving a final score that is different from his/her preliminary score. If this occurs, reviewers are expected to revise their critiques and criterion scores to reflect such changes. Nevertheless, an applicant should refer to the resume and summary of discussion for any indication that the committee’s discussion might have changed the evaluation even though the criterion scores and reviewer’s narrative may not have been updated. Recognizing the importance of this section to the interpretation of the overall summary statement, NIH has developed a set of guidelines to assist review staff in writing the resume and summary of discussion, and implementation is under way. If you have related questions, see the Enhancing Peer Review Frequently Asked Questions. Editor’s Note: In the third section, we deleted “up” for clarity. Of all the institutes and centers at NIH, NIGMS receives the most Academic Research Enhancement Award (AREA, R15) applications and funds the most AREA grants. This is probably because the faculty and students at eligible institutions, which have not been major recipients of NIH research grant funds, typically focus on basic research using model organisms and systems. As Sally Rockey of the NIH Office of Extramural Research has noted, the new AREA funding opportunity announcement includes additional questions reviewers are expected to address that are related to the program’s goals of supporting meritorious research, strengthening the research environment of eligible institutions and exposing students to significant research. With the next AREA application deadline coming up on February 25, I’d like to point out how and where applicants might address the new review considerations. SIGNIFICANCE: If funded, will the AREA award have a substantial effect on the school/academic component in terms of strengthening the research environment and exposing students to research? Include a summary discussion at the end of the Research Plan, but provide most of the information on lab space, required equipment and facilities, and the availability of students to participate in the proposed research in the Resource page of the application. You and your institution should also include a description of the current research environment and of students who have continued in the biomedical sciences. In the Significance section as well as at the end of the Research Plan, discuss how the potential R15 support would enhance the research environment and increase the number of students exposed to meritorious research. Please remember that the research proposed should be significant, have an impact on the field and be well justified. INVESTIGATOR: Do the investigators have suitable experience in supervising students in research? Take advantage of the Biosketch Personal Statement to provide specific information about current and former students participating in your research projects. Highlight publications with student co-authors in the Biosketch, and describe the role of students to be supported on the research project and which aim they will help with in the Budget/Personnel Justification and in the timeline at the end of the Research Plan. APPROACH: Does the application provide sufficient evidence that the project can stimulate the interests of students so that they consider a career in the biomedical or behavioral sciences? As noted above, address this question in the Resource page and the Biosketch Personal Statement with a discussion of students who have previously worked on aspects of the research and who plan to pursue scientific careers. At the end of the Research Plan, I highly recommend including a list of students and a timeline for what each of them would be doing and what research question or approaches they would be exposed to during the R15 support period. ENVIRONMENT: Does the application demonstrate the likely availability of well-qualified students to participate in the research project? Address this question in both the Resource page and the Biosketch Personal Statement by discussing your record of recruiting interested students who are excited about doing research and helping you accomplish your specific aims. Does the application provide sufficient evidence that students have in the past or are likely to pursue careers in the biomedical or behavioral sciences? As indicated above, with assistance from your institution, use the Resource page to provide a description of students who have majored in the biomedical sciences and who have gone on to graduate or medical school or other biomedical science careers. Use the Biosketch Personal Statement to describe students you have supervised.